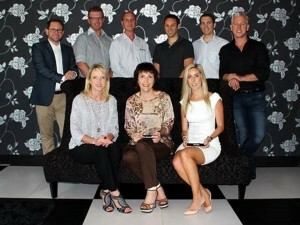 Intervate and The Foschini Group. TFG's (The Foschini Group's) recently-developed Intranet solution has been confirmed as one of the world's top 10 intranets in the prestigious 2015 Nielsen Norman Intranet Design Annual. Developed in partnership with Intervate - an enterprise information management specialist and part of the T-Systems Group - the Intranet was recognised by Nielsen Norman for its intuitive design and user experience, and its innovative use of new technology. TFG and Intervate became the first South African, and indeed the first African, winner in the Design Annual since its inception in 2001. Jakob Nielsen, principal of Nielsen Norman Group, describes TFG's intranet as "a dynamic and engaging way to access information, connect with colleagues and get work done". "It incorporates elements of TFG's corporate identity like brand, colour and fonts in a way that puts a fresh design on the intranet. The modern style and features support employees in the head office, regional office, and distribution centre, as well as field management," adds Nielsen. Intervate Cape Town MD, Wilhelm van Rensburg says: "The sense of reward from knowing we are contributing to industry best-practices at a global level is immense." Van Rensburg explains TFG needed to evolve its intranet from being essentially a static document hosting service, to a more dynamic environment that made finding information easier, encouraged collaboration between teams, and facilitated internal communication and innovation. TFG's intranet benefits from rich, visual designs that emphasise the top company news in a rotating carousel. Topical messages from leadership and from various areas of the business are combined with simpler features like birthdays, work anniversaries, canteen menus and weather forecasts, for example. The 'About Me' section encourages staff to populate their profiles with information about their skill sets, their recent projects, and what they're currently working on - all with the intention of fostering greater collaboration between business units and teams. Van Rensburg adds: "Optimising the intranet for mobile was a key consideration, with increasing numbers of users accessing the Intranet from smart devices, and with many staff constantly on the move and in various regions throughout the country." TFG's team manager, Marius Botha, explains any company on a quest for innovation and fresh ideas needs to have a strong focus on people, communication and culture. "The new intranet is a vehicle for collaboration and innovation that promotes an environment of engaged and high-performance employees," he adds. The Nielsen Normal Group 2015 Intranet Design Annual can be purchased here: http://www.nngroup.com/reports/intranet-design-annual/. Deutsche Telekom is one of the world's leading integrated telecommunications companies with over 142 million mobile customers, 31 million fixed-network lines and more than 17 million broadband lines (as of 31 December 2013). The Group provides fixed network, mobile communications, Internet and IPTV products and services for consumers and ICT solutions for business customers and corporate customers. Deutsche Telekom is present in around 50 countries and has approximately 229 000 employees worldwide. The Group generated revenues of EUR 60.1 billion in the 2013 financial year - more than half of it outside Germany. Drawing on a global infrastructure of data centres and networks, T-Systems operates information and communication technology (ICT) systems for multinational corporations and public sector institutions. T-Systems provides integrated solutions for the networked future of business and society. Some 50 000 employees at T-Systems combine industry expertise and ICT innovations to add significant value to the digitisation strategies and core business of customers all over the world. T-Systems generated revenue of around EUR9.5 billion in the 2013 financial year. Since the inception of T-Systems in South Africa in 1997, the company has cemented its position as one of the most successful T-Systems companies outside of Europe. A leading ICT outsourcing service provider locally, T-Systems offers end-to-end ICT solutions in both the ICT operations and systems integration markets. Their extensive portfolio of services covers the vertical, horizontal, IT and TC space. T-Systems South Africa's head office is located in Midrand with another major office in Cape Town, and 20 further representative offices in locations throughout southern Africa. Intervate, a T-Systems business unit in South Africa, is a specialist provider of enterprise information management (EIM) and process automation solutions that improve productivity and collaboration, reduce costs and increase legal compliancy. The company has over 14 years' experience in delivering solutions to enterprise customers in both government and private sectors. Its technical expertise is supported by an understanding of the strategic drivers and challenges relating to EIM. This enables Intervate to provide its customers with professional guidance regarding the best practices proven to deliver successful projects and business benefits.